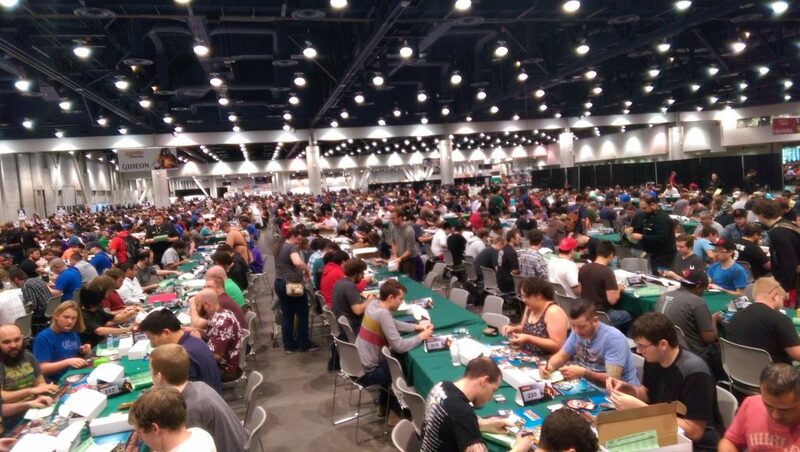 Last year we ran the world’s largest Grand Prix in Las Vegas with just under 8,000 players in the main event, and over 600 judges! I was fortunate enough to attend all four days, and worked a variety of judge and staff positions, so this gave me a unique perspective on the event and wanted to share. My Grand Prix experience started before I arrived at the venue… when we arrived one of the players on the airplane came close to getting in a fight with another passenger but eventually his friend and I succeeded in getting the players off the plane and into a cab to avoid anything unfortunate or stupid. As judges, we’re seen not only as responsible authority figures during tournaments, but also there are expectations that carry over into our interactions with players and the public outside of the game. As public figures in the community, we are looked at as moral barometers and continue to have influence even off of the venue. Because of my experience working staff positions I get assigned to help out with the VIP registration and was put in charge of the line for “Special Ops”. The inclusion of a “Special Ops” line worked well: That way, if anything out of the ordinary arose while processing the lines, the person was sent to the Special Ops line for follow up without delaying the processing of the rest of the queue and by centralizing the exceptions we were also able to recognize larger problem patterns quickly. The day went by in a blur, and the next thing I knew it was 10pm at night… and all I’d had to eat was a handful of cookies from the VIP lounge. Judge Lesson #2 – Don’t be a Hero… Take Breaks! When working a long event, especially multiple days, it is critical that you don’t burn yourself out. Staying rested and hydrated makes you better at handling what you’re assigned to do, benefiting your team and the players. Even when you have a team lead you should help them help you by asking for breaks or communicating when you realize you aren’t feeling so well. If you see someone walking like a zombie, ask them when their last break was and make sure they’re ok… many times judges in particular get focused on their assigned role and don’t recognize when they’re fatigued. This work experience Thursday was a good reminder of this and I made sure to pace myself and take breaks the rest of the weekend. Sometimes at big events they just need bodies, and resources are deployed to make sure things run smoothly. This is the real reason judges are assigned levels… not to look down at lower level judges but as a quick way for leaders to assess what roles and responsibilities a person can fill when there isn’t the luxury of getting to know them or having worked with them previously. Due to a snafu the person I was assigned to report to wasn’t on shift. No matter, I quickly found the area leader (in a crimson shirt so he stood out) and got assigned a job detail helping cover the floor so that judges already on since the morning got breaks. It’s common for things to be slow sometimes, or unplanned problems to arise. When things come up, it’s important to have the flexibility to adapt on the fly… be sure to work with your team to ensure nothing gets dropped. We were well staffed, particularly during the overlap between shifts, so before long I was done with my work assignment and again found myself looking for more to do, so I returned to my crimson shirted leader to report my status and register for my next assignment: patrolling the aisles and straightening up the area/answering rules questions. When assigned a task, get to it quickly, make sure it’s completed, and then report back to that person that it is done. Don’t assume that the completed status will be visible or wander off without letting the person know the task is finished. In a big chaotic environment, you want to be known for being dependable, not that judge who disappeared for half of his or her shift. After a few more hours of patrolling the floor the morning shift ended and I took over running grinder events for a morning judge. By the time I took over for the morning judge the volume of players had slowed down and our surge staffing diminished, so we had returned to the more standard “each judge runs a few pods” approach and there was room to spread out a bit more. As it approached 9pm demand was slowing down, and we had plenty of staff available, so I got permission to head upstairs and to assist with the Platinum VIP party, since I had spent all day Thursday registering VIPs and was familiar with many of them. The “Platinum” party allowed a small number of VIP attendees to mingle with WotC employees, Magic celebrities, and notable Pro players with excellent food, live broadcasts of well-known Magic streams, and even our very own Elvis impersonator! The event was well received and I heard lots of rave reviews. A note on the Platinum VIP registration level: All of the Platinum VIPs I spoke with were extremely pleased with the way they were treated and the upgrade perks. Vegas is a place for high-rollers, and our Platinum VIPs enjoyed not just the Planeswalker benefits (fresh cookies, ice water, lounge areas on the GP floor) but also had access to the party and a Platinum lounge overlooking the event with Xboxes for playing Duels of the Planeswalkers during downtime and a dedicated judge to run 8 person MM15 drafts on-demand! At big events judge roles are divided into specialty areas to ensure that they have sufficient coverage. There are teams assigned to posting pairings, performing deck checks, etc. Logistics handles ensuring the tables are being covered for judge calls, deck building is running smoothly, and deck building for sleep-in-special players is fairly handled in waves after the event has started. Judge Lesson #5 – Stay Hydrated! Judging frequently means long days and infrequent breaks. Having a water bottle or refillable cup is a really great idea to avoid dehydration, which is particularly a concern in hot or arid climates. Sipping water throughout an event can help one stay sharp and avoid fatigue. As the event wore on, I noticed that at the beginning of each round we had more staff than we typically needed and that the empty areas away from us near the doors were fairly trashed. Also, the closest water fountain was pretty far removed from our event, so after getting the last slips in to finish the round, I started a pattern of first checking in with my lead then going and refilling my water bottle (and often others’) and then briefly straightening up the disheveled tables and chairs to improve the entrance area (Chandra section) before returning back to the floor, and this seemed to work quite well. After kicking off round 6, attrition had taken away enough players that we had extra capacity, so the Logistics team got pulled in to instead take over for the team running the side events. When we arrived, the judge team we were replacing appeared stressed and relieved to see us. 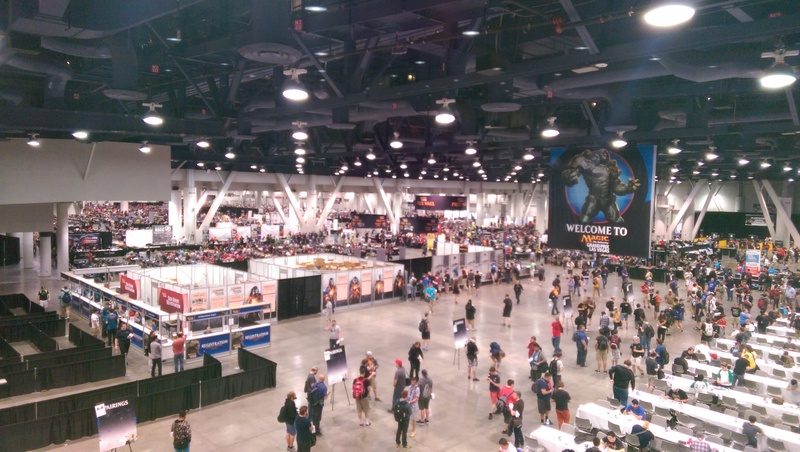 With the continued attrition in the main event the Sides became more and more popular as the day progressed, especially the Modern Masters 2015 drafts. The main event was still running when I got off shift, so I had a great time visiting with players between rounds and visiting artist and cosplayers who were still around. After another hour I headed upstairs to the judge room where a judge was having a birthday party and playing board games. 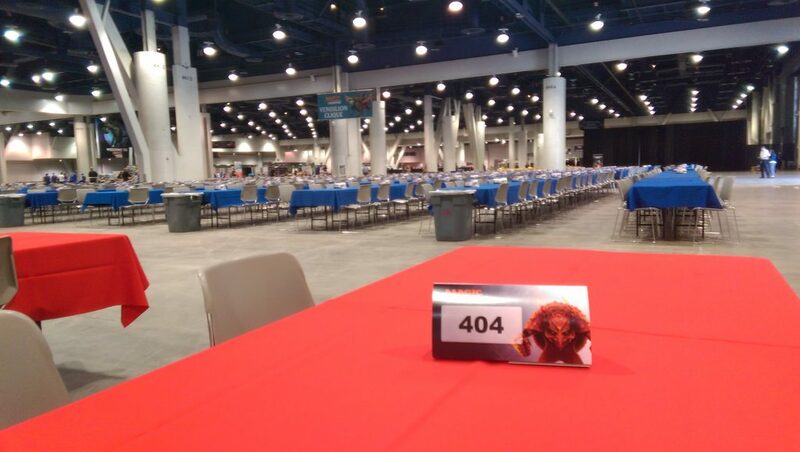 Las Vegas wasn’t just the largest GP in Magic history, it also had the largest judge staff in GP history… over 600 judges from around the world. The Judge Program is a tightly knit community. Grand Prix (and Pro Tours) provide a unique opportunity to get to know judges one wouldn’t meet otherwise. After being at the party a while I joined some East Coast judges I’d just met and we left to go get food and drinks out in the city. 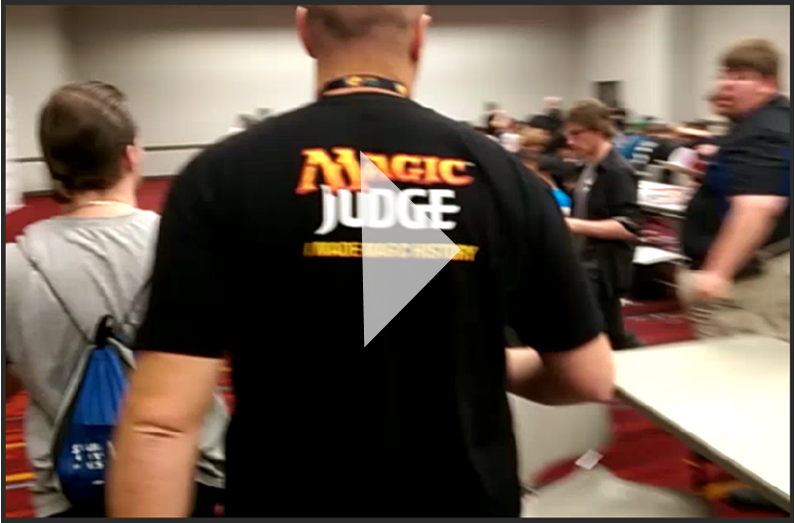 (I mostly work West Coast events, so getting to know judges from other regions is a bonus.) It was great meeting those guys and I look forward to getting to work with them again. Besides judging, I have also staffed Grand Prix Prize Walls more than just about anyone else… and why not? It’s an awesome opportunity to spend time with the players and help celebrate their successes, help them think through their options, or set their sights on something epic they could try for. Prize Wall is a great way to help make the Grand Prix a wonderful experience for the players and I think everyone should try working a shift… it’s a great way to see the event from a different perspective. In keeping with the Vegas theme, this was also the largest Grand Prix Prize Wall ever. On typical Prize Walls, there’s a rush on Sundays as big events finish and players are hurrying to use their prize tickets before the end of the GP, so I was concerned that this could be a big challenge due to the scale of this eve, but it wasn’t a problem. The Prize Wall was well laid out and functioned like a little store, with extra stock in back and order forms for t-shirts and other boxed items. We stayed at the Prize Wall until all of the events giving out Prize Tickets were concluded, and luckily we avoided getting slammed. The party was great, even though I showed up late, due to being on the late shift. There in the event hall there were two big rooms of judges, artists, and other celebs all sitting around drafting Modern Masters II. 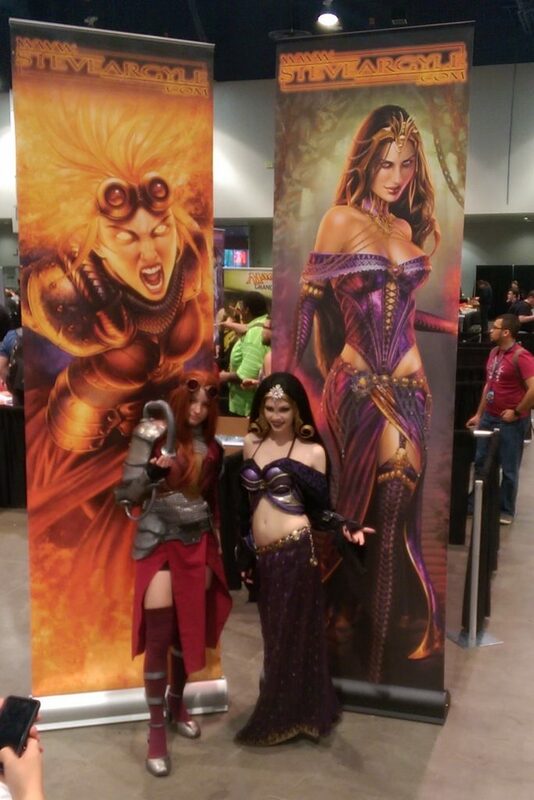 Props to Cascade Games and Channel Fireball for handling the logistics for such a big event so smoothly! I also appreciated that with so many judges involved the hotel rooms were included in the judge sponsorship, as that saved time and ensured that the rooms were conveniently close to the venue. All in all, the weekend was amazing, and having proven the success of events on this scale, I look forward to us running future mega-events!